Although you do not need to wear a tie in order to browse with Opera, using such a fine software program requires a certain degree of respect. Whether you're using the Opera Turbo feature or enjoying the Discover mode, you must be appreciating it. Its noble interface and varied content will bestow grace and cadence over your desktop. Alright, enough nonsense, let's see what this Opera is capable of. Opera boasts a metro style inspired speed dial screen, but it also allows you to switch back to the previous design choice (especially useful for users who do not exactly appreciate the Windows 8 interface). The items on the spring board can be moved around and grouped into folders. There is a Google search bar and buttons for the three main sections, Speed Dial, Discover and Bookmarks. Nothing exciting going on here, let's move on. Discover is a wall full of article stubs. The items are presented like a magazine and are gathered from news sources and article sites. They encompass science, sports, art , gaming, food, health, busyness and more. You can customize this section by selecting what kind of articles it should display. Changing the language will bring up articles in the selected language (more than thirty). This feature is DANGEROUS! You can start simply by browsing through the headlines, maybe changing the topics, when finally something will catch your eye. You will follow the link and then spot some other interesting article. So forth and so on until you'll realize that you've spent three quarters of an hour reading random articles when all you wanted was to check your e-mail. Bookmarks on the other hand are simply amazing. Whenever you add a page, a pop-up will appear where you will be able to add it to the speed dial or a specific bookmark folder (or both). In the Bookmarks screen you can edit them, move them between folders, create folders or delete them (TIP: You need to click on My folders in order to delete one). The only downside is that there is no bookmark toolbar. Really, after creating the perfect bookmarking system, they omit including the the most practical bookmark solution of the last decade?! Anyway, if you're really annoyed by that, you can just change the theme. Maybe it will make it better. It might, actually. Opera has some pretty nice pictures to work as a background theme. Opera Turbo (if enabled) filters your pages through a server that simplifies pictures, compresses downloads and removes irrelevant page elements. This means higher speeds and lower bandwidth (for those who hang on a dongle). As for the add-ons, they're all there, no need to worry. 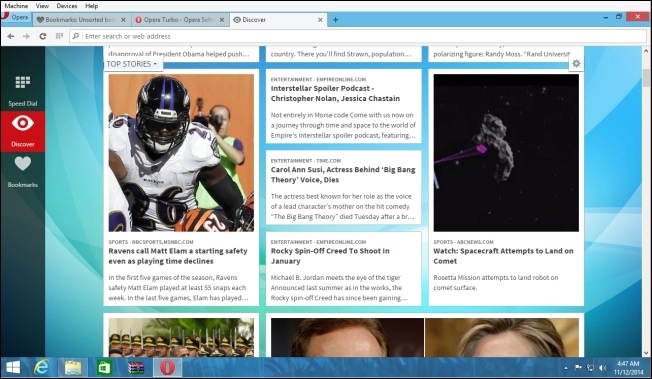 Opera Link can keep your bookmarks and history organized over multiple devices. 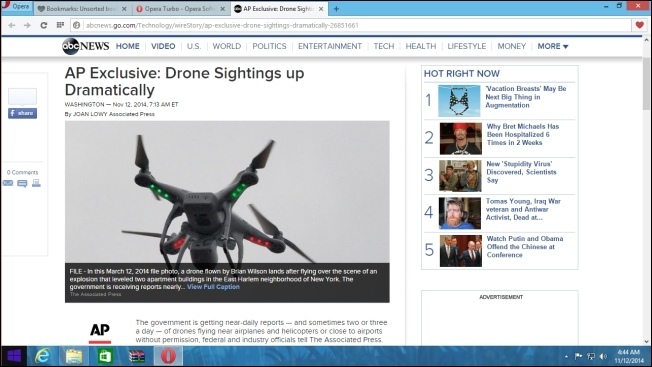 Although it is not as rich as the competition in terms of features and functions, Opera is specifically designed to contain what a web surfer really needs: new things to discover, traffic speed and a smart bookmarks function.